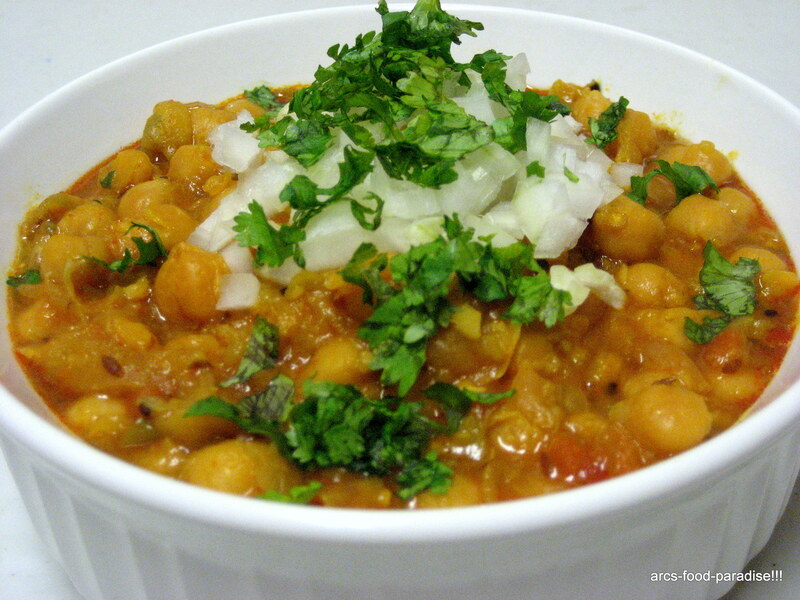 Chole/Chickpeas curry | The Flavor Nook! 1. Empty the chickpeas from the cans into a bowl. Rinse well under cold water and keep it aside. 2. In a wide skillet/pressure cooker, heat about 3 tsps of oil. Add cumin seeds, mustard seeds, cloves, cinnamon sticks and saute for a minute or two until they start to splutter. 3. Now, add the chopped onions and green chillies to the skillet and saute for a few minutes until the onions are translucent enough. 4. When the onions are done, add ginger-garlic paste and saute for a minute. Now, add turmeric, red-chilli powder, coriander powder, salt and saute for about 3 to 4 minutes. 5. Add the finely diced tomatoes to the pot. Cover and cool until the tomatoes are very tender. 7. Finally, add few coriander leaves and lime juice and give it a quick mix. 8. Garnish with some chopped onions and coriander leaves. Serve it with puri, roti, naan or pulav and your family or guests will be asking for more of this spicy and yummy dish. Pingback: Puri / Poori | Food Paradise!! !